It turns out that the secret to a longer, healthier life isn’t really a secret. And the solution isn’t expensive. At LifeVantage we take on aging with two, scientifically proven products that work together so your cells produce the antioxidants and the mitochondria they need to fight oxidative stress and power your body. 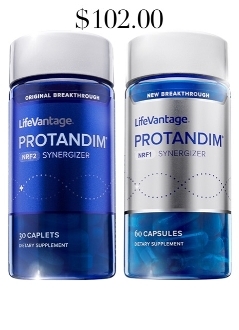 Nrf2 and NRF1 Synergizers are an age-defying one-two-punch. And they’re available in one complete package.